You have to shop for clothes and school supplies. You need to figure out how the kids are going to get to and from school each day. You need to pack their lunches or send them to school with money to buy their food. There is a lot to think about when it’s time to send your kids back to school! Even in all the chaos, though, it’s important that you don’t let your children’s oral health go by the wayside. A children’s dentist in Kaukauna explains why regular cleanings are so important for your little ones. The dentist can remove plaque buildup and check for any issues that might bother your children later on. Cavities can be addressed before they become serious problems. You and the dentist can work together to help your children build good oral health habits that will last a lifetime. Children should go to the dentist once every six months or so to get a cleaning and checkup. This can be a challenge if your kids dread climbing into that big — seemingly scary — dentist’s chair. 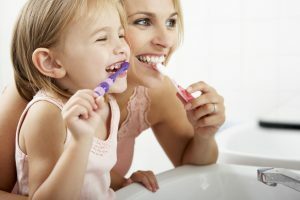 Try to make dental care a positive experience by offering teeth-friendly rewards after each visit and reminding your kids again and again how important it is to take care of their adorable little smiles. When your kids go back to school, there is no telling what might happen to their mouths. Maybe the other kids will share candy and other sugar-filled snacks, or maybe a sports accident will result in a dental emergency. Emphasizing good oral health habits at home can help mitigate the effects of some of the teeth-damaging things that might happen at school. Make your children enthusiastic about oral health by getting them colorful toothbrushes and other gear that appeals to them. Get them a timer so they know exactly how long they need to brush their teeth for each day. You can also find fun activities and videos online that encourage healthy habits. Never neglect the power of example. If your children see you diligently brushing, flossing, and rinsing every day, they’ll be more likely to do the same. Keep your kids’ smiles bright and cheerful by scheduling regular visits to a children’s dentist in Kaukauna! Doctors Robert and Heather Heil are happy to take care of patients of all ages, including children. As parents, they know how vital it is that kids learn good oral health habits and visit the dentist regularly. If you have questions about children’s dentistry or you’re ready to schedule an appointment for your little ones, contact Dental Expressions via the website or by phone at 920-788-6280.